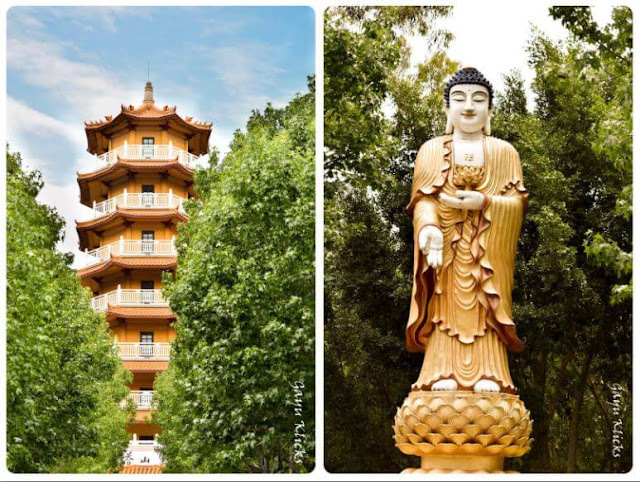 Nan tien temple is said to be the largest Buddhist temple in the southern hemisphere. This is located around 80kms from Sydney, in Wollongong. This has been a long waited trip for me. Luckily i visited this temple in the First half of the day when it was cloudy and not peak sunny. The place is such a treat for anyone who loves nature. There is greenery everywhere, cool breeze, pond, colorful flowers, bright decorations and lanterns. Firstly when you enter, you can see a big traditional Chinese arch welcoming you. There are plenty of parking space. If at all you din't find a parking you can park it on road and walk inside. As you walk by towards the front shrine, you can spot different child monks statues. This is also called as Great Compassion Shrine. The front shrine is the statue of goddess Avalokitesvara Bodhisattva ( Guan yin in Chinese ). The Goddess is said to have 1000 eyes and hands with one eye in the middle of her eyebrow like the netrikan of Lord Shiva. This building is also called as Great Hero Hall. There is 5 Buddha statues namely, Li-Bu-Wei , Amitadha, Tuo-Pao, Miao-Se-Shen, Gan-Lu-Wang . The pagoda is the tall building you will see while you walk towards the front shrine. The pagoda was built similar to the Sanchi Stupa of India. Later it was modified in the Chinese Style, built eight floors one over the other including the ground floor. The structure is tapering which signifies as if you practice Buddhism very authentically, it will lead your path to moksha / enlightenment. The ground floor of Pagoda has the statue of Ksitigarbha Bodhisattava, who helps people to attain enlightenment, while the remaining seven floors have the cremated ashes of Buddhist devotees. Once you reach the top of the Pagoda, you can view the dazing beauty of Mount Kelamba. One can also find Gouthama Buddha statue at the parking. Lotus is a part and parcel of Buddhism. It is not only amazing, it also denotes purity. The lotus pond is filled with lotus plants. You can also spot varied colored fishes and ducks. Oh! How can i ever miss the statues around?? Such an architectural place. I got fascinated with those curves and bends and i landed up clicking all the statues there. They would look more beautiful if they had been well maintained without spider webs and bird's poo over them. Flowers can be found not only in the lotus pond, but also at the cremations. These cremations can be found near the grass parking towards the entrance. These are the cremations of the Buddhist Monks and followers. child monks statues are cute... nice blog... amazing photography.. keep it up!!! 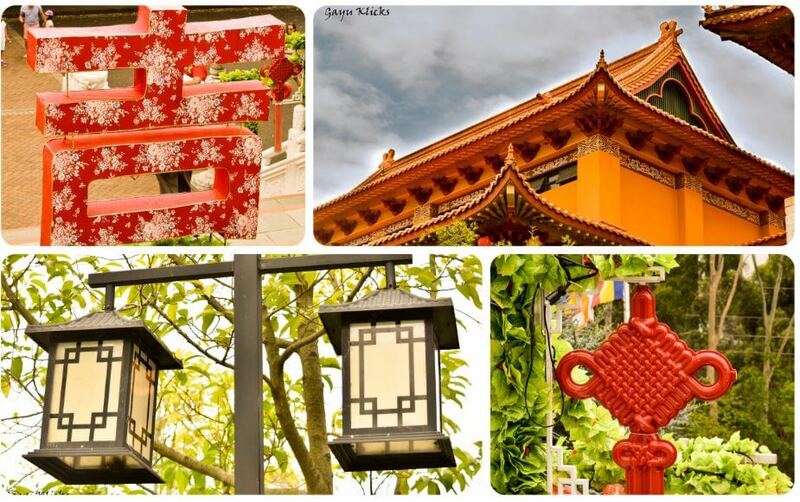 You have taken beautiful photos of Nan Tien Temple. Nan Tien Temple was built under the guidance of Venerable Master Hsing Yun, the founder of Fo Guang Shan Monastery in Taiwan. A tranquil and peaceful place for reflection. There's one part in your blog that you mentioned about cremations and flowers. "Flowers can be found not only in the lotus pond, but also at the cremations. These cremations can be found near the grass parking towards the entrance. These are the cremations of the Buddhist Monks and followers." Since Nan Tien Temple has opened in 1995, the only cremation ashes can be found are in the Pagoda. However, not sure about the cremations where the grass parking towards the entrance is. "Once you reach the top of the Pagoda, you can view the dazing beauty of Mount Kelamba. One can also find Gouthama Buddha statue at the parking." The statue is Amitabha Buddha meaning boundless light and life. Buddhists say his name in greeting "Omitofo (in Chinese) or Amitabha" to bless others light (representing wisdom to dispel the darkness of ignorance) and longevity (well being for the person). Hope you don't mind, it is just for clarification.